Ergo, I like Batman action figures. Let's take a look at some of the best, shall we? It is Bat-Week after all. Did you really expect to get through a DC Comics-themed post and not read about a “Crisis” of some kind? Not these days! Twenty-two years after DC’s highly-successful, continuity-destroying maxi-series ended, its toy line began. 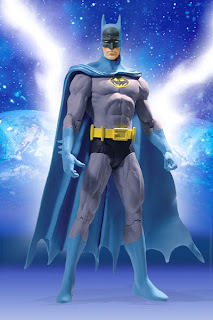 As far as the “classic” Batman look goes, this figure cannot be beat. Designed by George Perez (while channeling Neal Adams), this figure seemed like an odd choice for the CoIE line. But, who cares? It’s awesome, while still being “your Daddy’s Batman”.